Who is the DP-UB9000 designed for? Panasonic’s DP-UB9000 bucks a trend: The company is shipping this high-end, high-performance, high-priced Ultra HD Blu-ray player at a time when some manufacturers—including Samsung and Oppo—have altogether stopped building Blu-ray players for the U.S. market. Streaming your favorite movies is super convenient, and if your ISP can deliver sufficient bandwidth, you can even stream some films in 4K resolution with HDR. But if you really want to see what your 4K TV can deliver, there’s nothing like playing discs on a Blu-ray player such as this one. And the A/V idealists in Panasonic’s Osaka lab and its Hollywood mastering facility are confident there are enough of us who won’t accept experiential compromises in our home theaters to justify bringing this polished, user-tunable piece of gear to market. And for those times you do want to stream, the DP-UB9000 connects to all the major services, including Netflix, Amazon, and YouTube. This player will appeal to audiophiles as well, being packed with high-end audio features including an AKM AK4493 32-bit DAC, balanced XLR outputs, and all the connections needed for multi-channel A/V receivers old and new. What’s more, it plays audio CDs with a clinical clarity that you just might find startling. It tickled my ears with a treasured Mobile Fidelity gold disc pressing of Steely Dan’s Gaucho, and then with a freshly unearthed, super-vamping 1997 set by Van Morrison at the Montreux Jazz Festival. The latter is bundled in the artist’s new three-disc Deluxe Edition of The Healing Game. 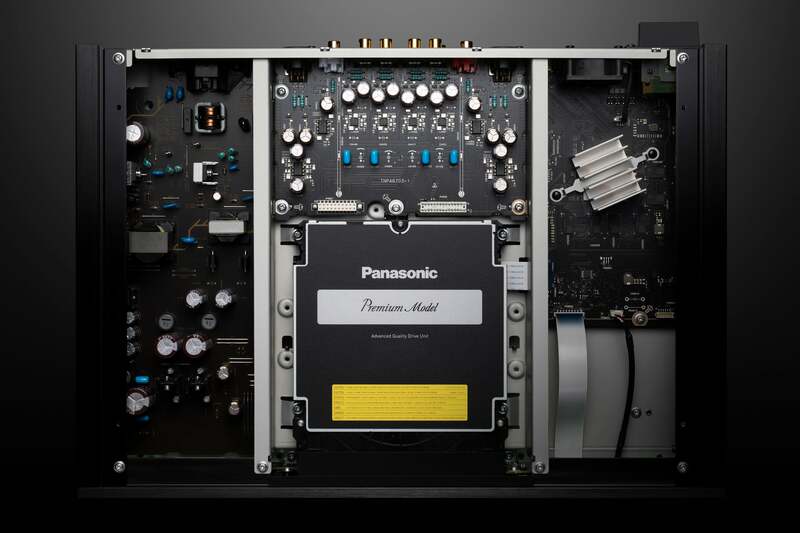 Panasonic packs the DP-UB9000’s robust chassis with lots of high-end audio and video components. Viewers with eagle eyes and golden ears—obsessive types wondering how they can make their entertainment system just a few percentage points better—are Panasonic’s targets here. Folks who’ve already invested time, effort, and money to calibrate their TV or video projector and fine-tune their surround-sound system for their home theater. That audience will find lots of tweakable options built into this box. I discovered small, subtly satisfying ways that the DP-UB9000 can make a TV look better, too. Dramatic splashes of light glow more vividly in Ready Player One. The color palate expands beyond the dominant green environment of Jurassic World: Fallen Kingdom more simplistically portrayed by other players. I suddenly noticed blue streaks in Charlize Theron’s Atomic Blonde tresses that I haven’t seen in other presentations. These improvements in color, shading, and clarity are finite but continual, adding up to more palpable, in-the-moment cinematic experiences. Panasonic’s HCX video processor revealed blue highlights in Charlize Theron’s hair (from her role in Atomic Blonde) that Oppo’s equally high-end UDP-203 did not. The DP-UB9000 is packed with high-performance components enclosed in a thick steel case that tips the scales at a hefty 16 pounds. That parts list includes Panasonic’s second-generation HCX (Hollywood Cinema Experience) video processor, which is largely responsible for the picture perks spotted in my A-B comparison tests with a Sony UBP-X800 and an Oppo UDP-203. I used both a 65-inch LG OLED (model 65E6P) smart TV and an Epson Home Cinema 4000 projector paired with a 108-inch Stewart Filmscreen StudioTek 130 G3. Panasonic’s engineers pulled out all the stops to deliver the best audio and video performance, putting a vibration-dampened disc transport, multiple power supplies, meticulous RF shielding, and audio circuitry that’s discrete from the player’s video circuitry. A purposeful pile-on to improve signal-to-noise ratios. The Panasonic DP-UB9000’s rear panel offers just about every connectivity option you might need. You’ll find a second HDMI port on the back of the player that puts out only audio. 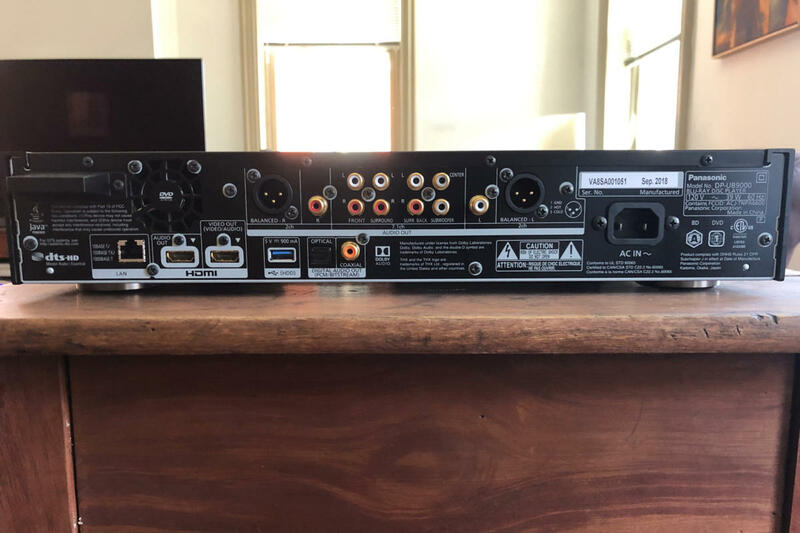 This will allow you to connect the player to an older A/V receiver that can’t send 4K video through to your display (which would connect to the player’s audio/video HDMI port). There are also eight analog audio outputs (for 7.1-channel material), along with optical and coaxial digital audio outputs in the event you have a favorite outboard DAC you’d prefer to hear instead. Two USB 2.0 ports are available—one in the front, one in the back—for connecting portable hard drives, so you can play digital audio files (supported formats include AIFF, ALAC, FLAC, and WAV; plus 11.2MHz, 5.5MHz, and 2.8MHz DSD). 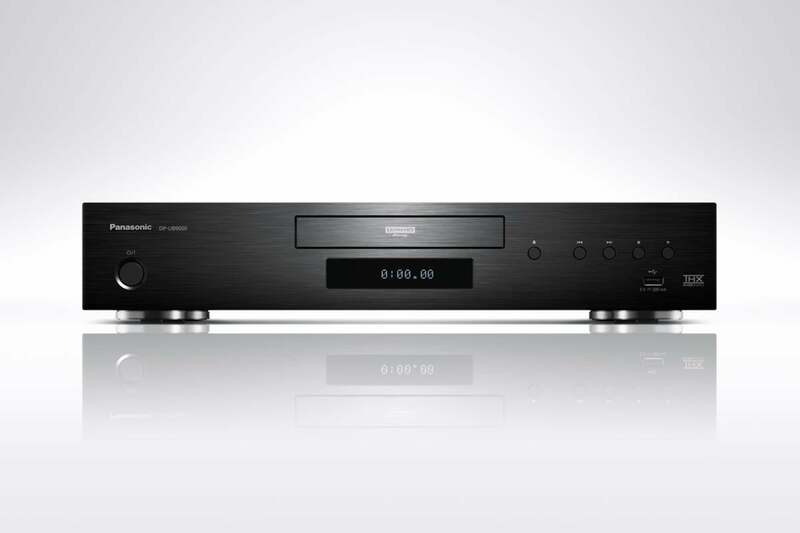 Despite its ability to decode Direct Stream Digital (DSD) files, however, this player cannot spin DSD-encoded SACDs or the high-res DVD-Audio discs Panasonic once championed. So it’s not a perfect replacement for the late and lamented Oppo UDP-203. If you have an inventory of SACD and DVD-A discs that need spinning, consider the Pioneer Elite UDP-LX500 ($1,099), or even the inexpensive Sony UBP-X800. One of the three Panasonic engineers who flew over from Japan to demo the company’s new player seemed surprised that geeks like me and Gary Reber (esteemed editor of Widescreen Review) were still asking about those dormant audiophile formats. “Maybe we’ll put [SACD/DVD-A] playback capacity on the next model,” he said. Sure. The remote control that comes with the Panasonic DP-UB9000 offers direct access to the player’s video, HDR, sound effect, and “High Clarity” audio settings. In designing the DP-UP9000, Panasonic’s engineers recognized that not all 4K displays are created equal, and they sought ways to give consumers both pre-programmed and highly customizable picture-tuning tools to do something about it. 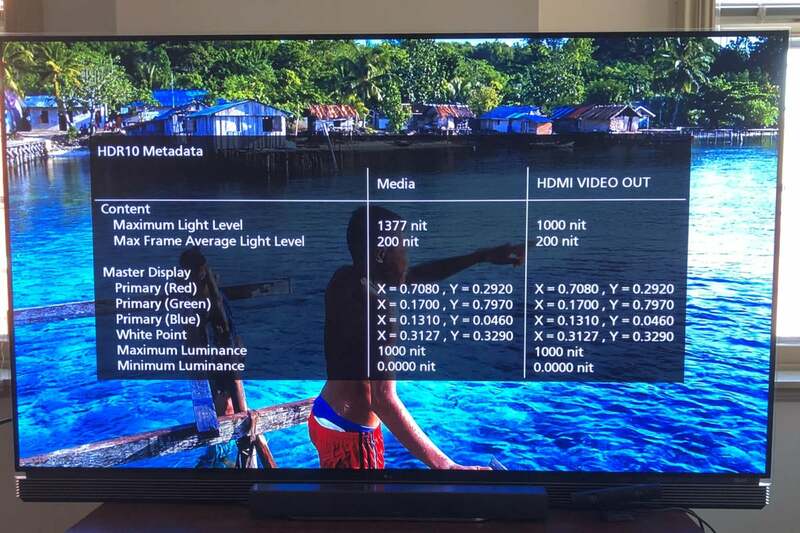 One of their most intriguing innovations is tone-mapping software Panasonic calls HDR Optimizer, which runs on the player’s HCX video processor. Using a 3D dynamic lookup table (LUT) color system borrowed from Panasonic’s professional monitor division (also found in its high-end FZ950 and FZ800 consumer OLED TVs, which are unfortunately not sold in the U.S.), HDR Optimizer re-assesses the average brightness level of a scene every 100 milliseconds and dynamically loads the LUT that bests fits the moment. The objective is to produce the optimum balance of color, luminance, and contrast for each scene. HDR Optimizer is specifically designed to enhance content that’s been encoded with HDR10, the static version of HDR in which a disc issues high dynamic range instructions to the display just once, when the disc is loaded. I found that the software had a tremendously positive impact on the HDR10-encoded movies I watched, including Guardians of the Galaxy Vol. 2, The Greatest Showman, Planet Earth II and Journey to the South Pacific. HDR Optimizer isn’t needed—and doesn’t engage—when you play discs encoded with dynamic HDR formats such as Dolby Vision, HDR10+, and Hybrid Log Gamma (all of which this player also supports). If you’re ever curious about the HDR10 metadata on any disc you’re playing, you can push a button on the player’s remote to display it overlaid on the video stream. The Panasonic DP-UB9000 can display HDR10 metadata on top of a disc’s content. 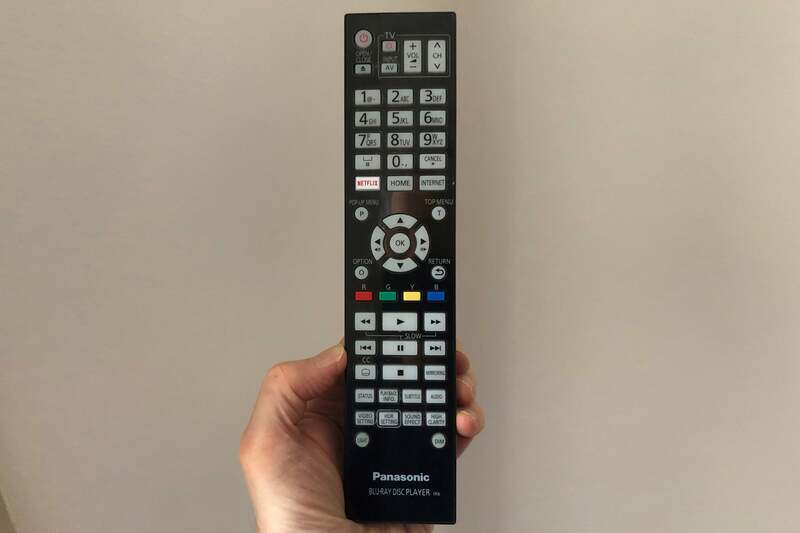 The DP-UP9000 exposes a vast number of display controls for your tweaking pleasure, but Panasonic also indulges more casual users with an HDR Settings button on the player’s remote. When you’re playing HDR content, pressing this button cycles through four image-processing presets that adjust the brightness of the entire screen. I found Standard to be best for dark settings, Natural Environment is good in rooms where you can control the ambient light (it proved useful for pulling out shadow detail on my Epson projector), Light Environment, and Bright (which was brutally oversaturated on the OLED). You’ll find even more tweaking options under Video Settings, where you can figuratively twist the dials for luminance, color, gamma, sharpness, and noise reduction. And to step back into the audio realm for just a moment, Panasonic provides lots of audio-processing options, too. You can sweeten the sound of an overly bright or low-res soundtrack, for example, by tapping the “High Clarity” button on the remote. That will cycle through a variety of choices, including six “Digital Tube Sound” settings designed to mimic the warm sound you get from a vacuum tube amp (I liked #2 best). This player delivers an awesome experience right out of the box, but it’s really designed for consumers who want to customize every setting until they get the best possible results when paired with the other gear in their unique environment. And if you overdo it and need to start over, returning the player to its factory defaults is just a button press away. This high-end Ultra HD Blu-ray player will make the most of your 4K TV, whether or not your TV is capable of supporting all the latest HDR formats. It's a damn fine audio device, too.